This was the follow up blog of the “Visual design drawings and construction" post. You should check the visual design series if you have not read them on my blog yet. One would say these drawings are very simple and not much stuff in them. Someone else would say ‘the simple it is, the more one can see’. So what holds true about those two sentences in this situation. First, you definitely want to show as much possible in the design. One has to show that details matter. It is the small details that make the most impact in an architecture design project. Why are we doing this? One reason of doing designs, whether architectural design or graphic design (anything in the design field) is about personal achievement or tomorrow, next week, next month or next year you might want to build your own custom house. Another reason of why one would be involved in the design field is that they can show their prospective clients of what they are capable of doing in architecture design or graphic design, whether they are showing floor plans (construction documents) or renderings or logo, flyers, and more (graphic design) They would probably be working in a firm or be freelancers which each situation has its ups and downs. In my situation, I had to do this exercise for one of my classes and we to show the details of how we achieved the desired look of the design of a particular floor plan that we chose from the first step that we did. This step can be anything you like. To try it out, you can setup a small scene for example or a simple floor plans where it is not much complicated. These were the base drawings and using the floor plan that we created, I developed a one-point perspective of the North wall and a two point perspective of the South wall below. 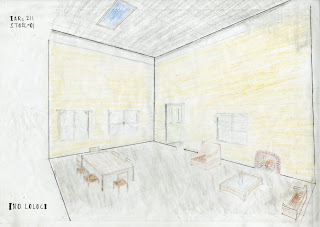 It began by laying out a grid using a horizon line and vanishing point and it required all items in the last assignment including a desk, a chair, book shelves, lighting, a point of entry, and a 1'x1' tile floor. 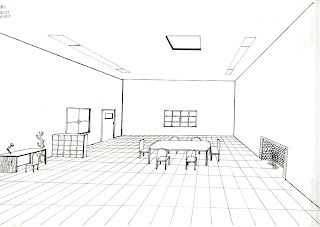 Drawing perspective drawings is not an easy task, but it could get accomplished if you put your mind into it and focus. This is something that you can pick up a pencil or pen/markers and just start doing different iterations/drawing until you get the desired look that you like and look for. It will not be the first drawing or the last so you have to keep drawing until your fingers hurt from holding the pencil. If you cannot come up with a different design/perspective, take a break and then come seat down and try again. This time you will have different ideas of what could or could not work and the paper will not be just blank after all. As I mentioned earlier, practice is key to progression. The finished perspective is on a 12" x 18" sheet of Vellum using black pen only.